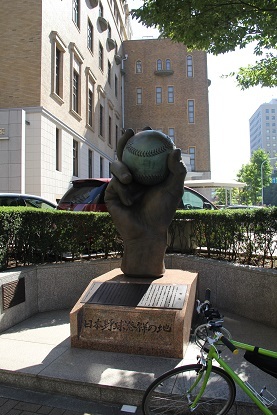 Here in1872 at the First Middle School of the First University District (Which developed into Tokyo University in 1877), Horace Willson, an American teacher, taught his student how to play baseball. In 1873, when it was renamed Kaisei Gakko and a playing ground was built, he reportedly enjoyed playing baseball with them. This is acknowledged as the beginning of baseball in Japan. In 1876, they played a game with a foreign team comprised of American living in Tokyo and Yokohama. Horace willson (1843-1927) was born in Gorham, Maine, in the U.S.
After participating in the Civil War as a volunteer, he made a teaching contract with the Japanese Government in San Francisco in 1871. He taught English and mathematics. His term of contract was officially expired in July, 1877. In2003, he was inducted into the Japanese Baseball Hall of Fame for his great contribution to Japanese baseball as the introducer of the game.